Back in August 2013, I did a quick look at the Kickstarter and demo of Revolution 60 and was very excited to play the full version. The Kickstarter was hugely successful, raising $12,728 out of the asked for $5,000 from 392 backers. In the future, an American orbital weapons platform has drifted off course, causing a diplomatic incident. A team of female special operatives must steal a space shuttle and stop the weapon from firing – but all is not as it seems. If you fail this mission, it will mean an all-out nuclear war. Revolution 60 stars only women – this is lampshaded at one point in the game, but the real world reason is that Brianna Wu made this game because she was tired of being told to make her own game if she didn’t like the games that were out. It was pitched as Heavy Rain meets Mass Effect meets 24, and I don’t know that it quite hits these marks, but it makes a good effort. The story is engaging, and I finished the game in a mere two sessions because I had trouble putting it down. It starts in media res, which is a bit disorienting, but the game quickly gets you to a place where you feel better about what’s going on. There’s a lot of cool, pulpy science fiction stuff going on, and Holiday (your main character) reminds me a lot of Buffy in both looks and making puns after killing enemies. The humor in the game is pretty great, especially from the villain. I’m curious to see what the other paths through the game are, and will definitely be playing again. Most of the dev team was made up of women: Giant Spacekat was founded by Brianna Wu and Amanda Stenquist Warner; the lead programmer is Maria Enderton; Carolyn VanEseltime did system design; and the battle system designer is Jenna Hoffstein. Much of the modeling and design work was done by Frank Wu, four-time Hugo Award winner. You can also get a companion book through iBooks for $3.99 called The Chessboard Lethologica, which explores the lore of the game in more detail. The art direction is based on the anime style (specifically Space Channel 5 and Sailor Moon), and Brianna has said that she based them on her own build. She’s also said that she might not make some of the same character design decisions now, and in the sequel, the character models will be a bit different. At the time of the previous article, I wrote about how I was a little wary of the character models, but now that I know the thought process behind the design, I feel much better about it. In-universe, it also makes sense that the women are all of the same general type – they’re soldiers, and most of them are genetically enhanced. The environments range from gorgeous (look at that spaceship! 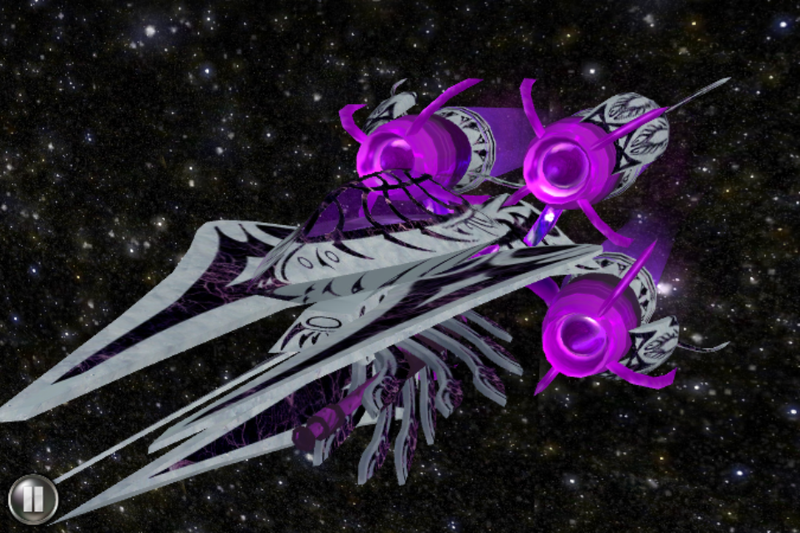 All the spaceships are AWESOME!) to a bit flat and stark inside the ships. Visually, I had a bit of trouble distinguishing where I was because everything blended together, and thus didn’t feel a lot of pull to explore. The sound design in the game is excellent. The soundtrack is extremely varied, with the choral bits being my favorite. There’s a lot of intense fight music, and there’s not a lot of quiet moments, but the music that’s there for those fits well too. The voice acting is some of the best I’ve heard lately; all of the women sound perfectly natural. My favorites were Holiday and the villain; you can tell that the latter is having so much fun. Gameplay is split between two main modes, story progression and dialogue. Dialogue choices (which are modeled on Mass Effect‘s dialogue wheel) sometimes involve attitude choices – professional vs. rogue. I played through as mostly professional, but couldn’t resist being a bit sarcastic at times. You’ll also be asked to side with either one character or another at various points throughout the game. All of these will influence your ending. Sometimes it felt like I wasn’t influencing things enough, but I appreciated the choice being there at all. Apparently there are 24 different endings! I played the game on the easy difficulty level, which was a breeze until the final boss. 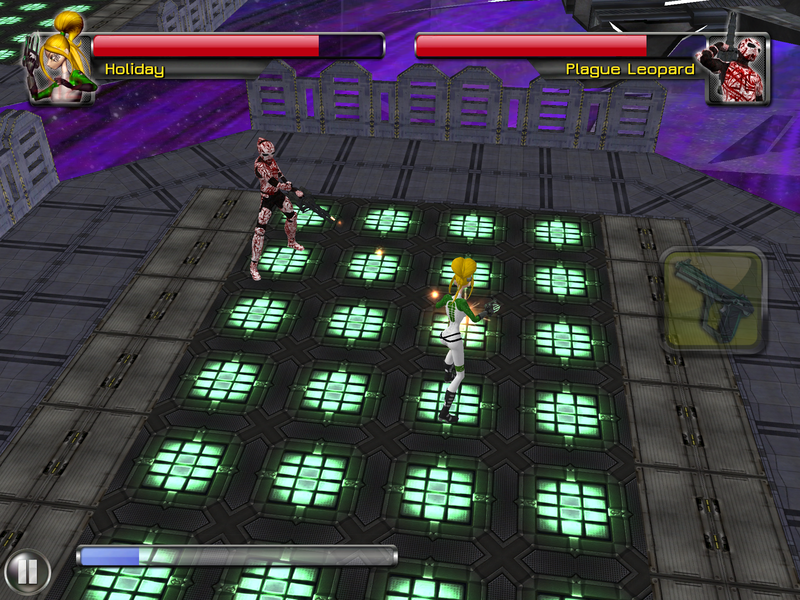 Combat is done from a top-down perspective in a kind of hybrid between turn-based and real time combat. Your weapons have a cooldown, and you and your enemy take turns attacking based on these cooldowns. The battlefield is divided into squares, and you can hop around the board to dodge your enemy’s attacks. Holiday will level up to assassin level nine, and she has a skill tree to make her a more effective fighter. You get two points per level, and you might not get to the last level of the tree (I didn’t). Sometimes I got a little bored while fighting, but that might be because I was playing on easy. There’s also quick time events that are interspersed throughout the game that involve tracing lines, circles, and squares; stopping a dot in the right space, and tapping two dots. None of these are particularly difficult, but some are timed, which sometimes made me panic a bit! If you finish the game on normal difficulty, you unlock the hardest mode of all – girlfriend difficulty, which is a jab at the lead designer on Borderlands 2 calling the Best Friends Forever skills “the girlfriend skill tree,” insinuating that women aren’t as good at games. This made me giggle. Revolution 60 is a cool space action-RPG that is well worth your time if you love RPGs with more narrative than strategy, and it’s absolutely awesome that it’s a game with an all-woman cast. Get Revolution 60 on iOS for free, with one in-app purchase that unlocks the full game for $3.99. It requires iOS 7.0 or later and is compatible with iPhone, iPad, and iPod touch. It’s optimized for iPhone 5. Visit the official site, Twitter and Facebook. Eventually, you’ll be able to get the game for your computer.